Safe Ratch Inc. is the exclusive manufacturer of the patented E-Z RATCH™ Torsion Spring Winding System for garage doors. Since 1997, Safe Ratch has had a proven record of excellence in designing and manufacturing the best garage door torsion spring winding system in the industry. Ease of use and adaptability of the tool allow it to be used on older and newer commercial and residential applications by professional installers and DIYers alike. See the E-Z RATCH™ Torsion Spring Winding System in action! 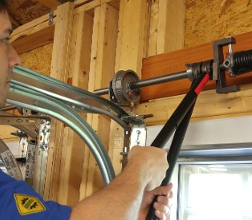 Winding and unwinding of garage door torsion springs with winding bars is at best a dangerous endeavor and in worst cases has proven to be fatal. Does this sound familiar – You are often leaning on a ladder, unbalanced, and feeling slightly nervous with the thoughts of the task ahead. Armed with a pair of steel winding bars or screw drivers, you insert the bars and hand-over-hand, one after the other, wind the spring. With every turn your anxiety level increases proportionally with the spring tension. You work more slowly and cautiously hoping not to make that one wrong move that will throw you and your tools off the ladder crashing to the floor, spring violently unwinding, possibly seriously injuring yourself only to have to climb back up and start over to get the job done. Garage Door Torsion Spring Winding System! Makes this risky job safe, easy, and fast without the worry! See the Products Detail page for more details and pricing. Don’t wait any longer. Order your E-Z RATCH™ kit today!